Central America is a territory of approximately 524.000 km², lying in the tropics of the American Continent. A mountainous chain, running across Central America, forms two watersheds: one at the Pacific and the other at the Atlantic. 70 % of the runoff of Central America comes from its Atlantic watershed, in which less than a third of the population lives. 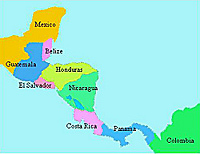 Six out of seven capital cities of Central America are situated in the Pacific watershed. Hurricanes, tropical storms, cold fronts, storm surges, and droughts appear constantly in the area, harming its socio-economic development and creating an urgent need for the countries to have reliable hydrological and meteorological services.